Will the submarine chancellor surface to talk about tax dodging? It seems the Tories have nowhere to hide today – now Labour is piling on the pressure over tax dodging and the HSBC scandal. Ed Miliband suggested the government had “gone into hiding” over the issue at his question and answer session in the West Midlands earlier today, and now Chris Leslie, Labour’s shadow chief secretary to the Treasury, has stepped into the fray. “We’ve now had a week of silence from George Osborne – the submarine chancellor still hasn’t surfaced,” he said. Earlier, Mr Leslie had said: “We need a full and frank statement from Lord Green explaining what he knew about what was happening while he was in charge of HSBC. “There are also mounting questions for ministers, which continue to go unanswered. 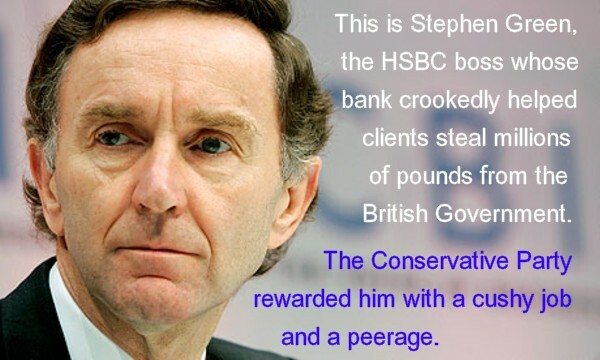 Did David Cameron and George Osborne discuss tax evasion at HSBC with Lord Green? The Prime Minister failed to answer this four times in the House of Commons. “Why did they appoint Lord Green as a Tory minister months after the government received these files? Why have we only had one prosecution out of 1,100 names? And why did George Osborne and the Treasury sign a deal with the Swiss in 2012 which prevents the UK from actively obtaining similar information in the future? bringing you the news as it breaks. This next one was 2 years earlier at his retirement do and is good for a laugh seeing their posh night out spoilt for them. Yes, I did an article about him when he quit HMRC, and linked to it when the HSBC story broke.